A soldier stands atop what appears to be the husk of a long-dead creature, looking around with Keyblade in hand amidst the clouds of dust and dirt in a field of purely Keyblades, rusting away with time. He is joined by two others, and the three meet in the center of the crossroads as they are confronted by the unknown elderly mage and his accomplice. 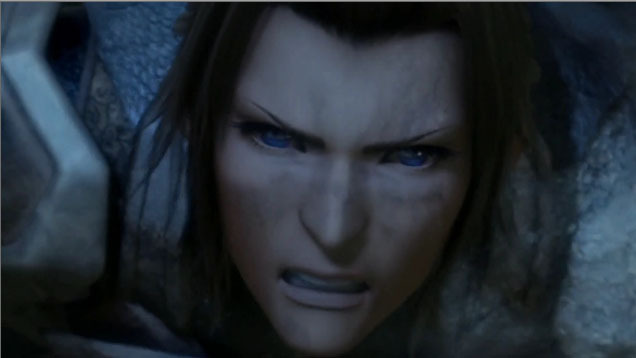 Terra, the oldest of the trio, charges forward in anger, leaving the other two behind as he leaps forward to strike his opponent. Instead of what expected to be a fair battle, he is pushed around like a toy, struggling to remain standing amidst the array of battle. With all his years of experience, he still proves no match for the older man, and is ultimately helpless in opposition. As the elderly mage summons the heart of all worlds, Terra can stand no longer to allow him to continue his plans and tears off his helmet, revealed deep blue eyes transforming to a sinister golden hue.